The heat of summer is set to trail off in the next few weeks. As fall reappears your enjoyment of a beautifully blooming garden does not have to disappear. Aside from the many fall vegetable options there are many blooming plants, trees, and shrubs that will carry your landscaping through pumpkin season. Why plant in the fall? There are several advantages for plants that start in the fall. Temperatures are cooler and rainfall is typically higher than in the summer months. Both of these factors allow for less watering. Fall planting also eliminates the need for fertilizer. These ideal conditions help rapidly establish a strong root system before the harsh summer season, which is especially favorable for trees and shrubs. 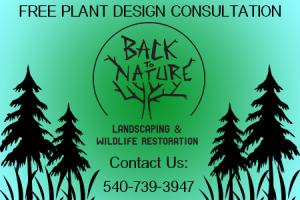 Back to Nature Landscaping & Wildlife Restoration is ready to help you plan for the fall season. Our staff includes Riley Wilmer, a graduate of Virginia Tech with expertise in agriculture technology and landscape management. He is equipped to assist you with all your plant design needs. If your imagination takes you to new spaces, Back to Nature also offers construction services, leaving you with no limits to your landscaping design. A design consultation is free! See the coupon at the end of this blog. When designing your space there are a few things you may want to consider. Think about the use of different textures in both plants and other elements such as pathway materials, structural elements, décor, and planters. To achieve unity in your design keep elements consistence and use repetition to bring the whole garden together. Start simple and keep in mind “less is more.” Later additional elements can be added where appropriate. Make transitions subtle and gradual. Whether your space is suitable for a symmetrical or asymmetrical design, these tips will lead to the best design for you.